Telexistence Inc.'s innovative robotics platform works via a master-slave arrangement and a head-mounted display, allowing the user to operate the humanoid robot from a remote location. What is telexistence? If you’ve seen the 2009 science fiction films Avatar or Surrogates, the concept is familiar. The technology, which has even garnered attention from America’s X Prize Foundation, allows human operators to manipulate genetically engineered bodies or lifelike robots from a distance, giving them enhanced abilities such as superhuman strength. Today, veteran Japanese researchers have teamed up with younger engineers and businesspeople to turn this fantasy into reality. From robotics to space development, high-tech fields in Japan have posted steady expansion amid an improved investment environment. In 2016, venture companies in Japan poured huge sums into three key areas: robotics was up 329%, artificial intelligence (AI) 246%, and the Internet of Things (IoT) 184% over the year before. The country’s Fourth Venture Boom, one result of Prime Minister Shinzo Abe’s growth strategy centered on economic reforms, began in 2014. Throughout Japan, industry, academia and government have jointly created an ecosystem focused on evolving technology that will enrich people’s lives in a society characterized by a rapidly aging population. Leading this charge is telexistence technology. 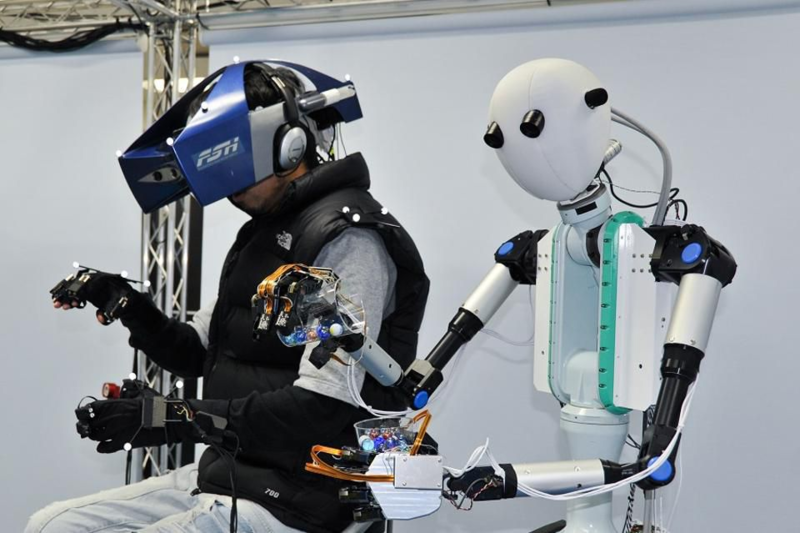 Researchers in Tokyo have developed a prototype “telexistence” humanoid robot that can be controlled by a user wearing a virtual reality head-mounted display (HMD) and haptic feedback gloves. Through this setup, the user can see and feel what the robot senses, allowing him or her to make changes to the robot’s environment. 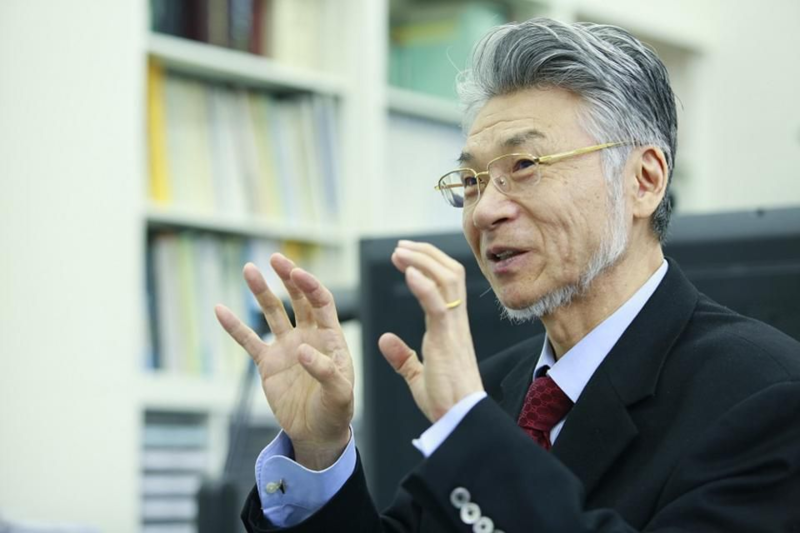 “Telexistence gives you a whole new body,” says the inventor of the technology, Susumu Tachi, Professor Emeritus of The University of Tokyo, and chairman of Telexistence Inc. One of the latest versions of his robots is the TELESAR (Telexistence Surrogate Anthropomorphic Robot) series. They can be controlled via master-slave links, effectively enabling human motions and control to be replicated in the robot platforms. They can even convey tactile and thermal sensations to the operator’s fingertips through haptic gloves adding to the realistic audio-visual sensation. “Telexistence gives you a whole new body,” says the inventor of the technology, Susumu Tachi. “Telexistence lets you work remotely, travel all over the world, entertain distant guests, or play sports you couldn’t play otherwise” says Tachi. “Children who are hospitalized long-term could visit Disneyland and share real experiences with their friends and family. Elderly people with mobility issues could attend a grandchild’s wedding.” The potential applications are enormous, and stretch from mining and manufacturing to medicine and outer space. “This technology can help free people from repetitive, tedious work so they can focus on creative activity,” says Telexistence Inc. cofounder and CTO Charith Fernando, whose engineering PhD was based on his work on TELESAR V. Moreover, it has the potential to change how people work in a society characterized by a low birthrate and an aging population. Factories and other facilities equipped with telexistence robots can operate 24 hours a day, with workers located anywhere in the world, and overcome the problem of staff shortages. For instance, during the daytime, doctors in Japan could cover a night shift at a hospital in Brazil before handing the robot over to personnel in another time zone. “In this way, telexistence allows you to overcome time and space,” says Jin Tomioka, a former business producer at Mitsubishi Corporation who is cofounder, CEO and CFO of Telexistence Inc. The state-backed Japan Science and Technology Agency (JST) has aggressively supported the development of this university-originated technology and invested in the startup in its seed round of funding. Tomioka and other staff came together from various backgrounds and established Telexistence Inc. in 2017. The team consists of experts from a variety of countries such as the Czech Republic, Panama, China and the Netherlands. In Japan, they have overcome both language barriers and work restrictions -- recent changes to Japan’s visa policy allow foreign staff to get work permits in only one or two weeks. For decades, Japan has been a robot superpower. This is especially true in the field of industrial robots, where key players such as Yaskawa Electric, Fanuc and Kawasaki Heavy Industries have cultivated advanced robot technology and helped Japan maintain a high global market share. To overcome Japan's rapidly shrinking workforce issue, The Government of Japan has been increasing its efforts to promote the use of robot technology as one of the measures to deal with these challenges. In 2015, the government announced its “New Robot Strategy” as part of the prime minister’s Abenomics economic reform program; it aims to enhance productivity in manufacturing, medical and nursing care, construction, agriculture and infrastructure. In addition, a new robotic conference called the World Robot Summit will be held in 2018 and 2020 with the aim of accelerating the social implementation and research and development of robots in daily life and industrial applications. Tachi has been showcasing his technology outside Japan, demonstrating it at the X Prize Visioneers 2016 Summit, where it was deemed “ready to launch.” The X Prize Foundation acknowledged that Japan holds the world’s most advanced avatar robotics technology. 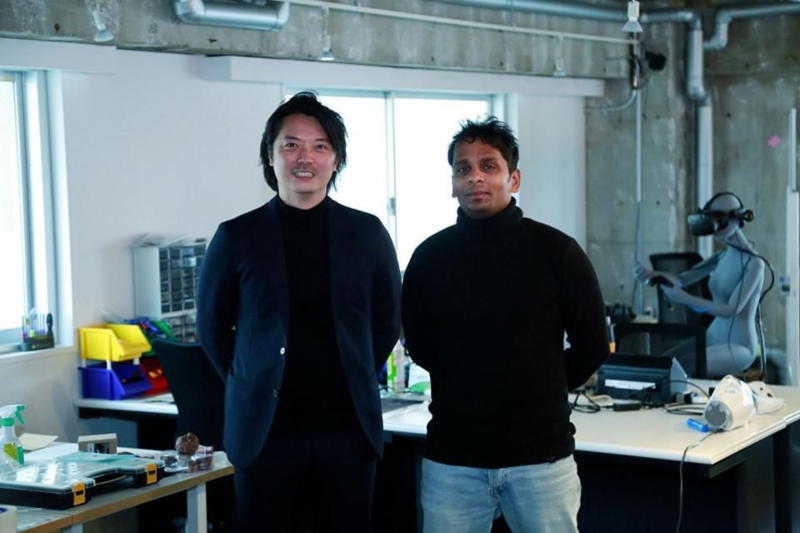 Telexistence Inc. has been gaining more and more attention and has attracted investment from several VC groups including KDDI’s Open Innovation Lab and Global Brain 6.